Calling all Singaporean & PR Visual Artists and Curators: The IMPART Awards 2019 is now officially OPEN for submissions! 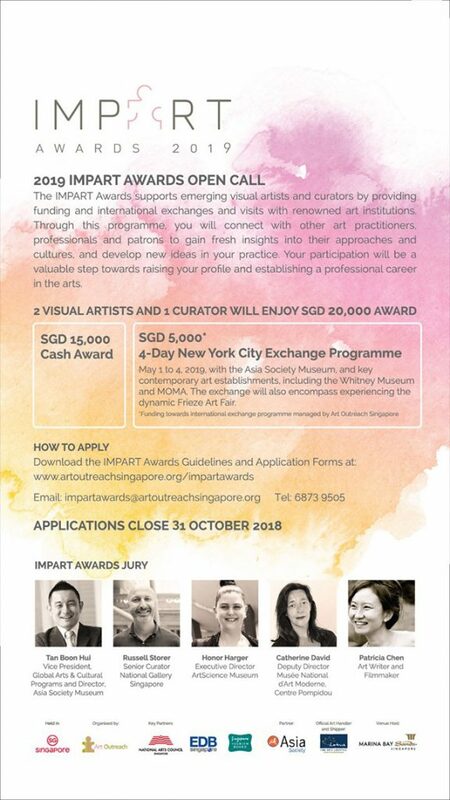 The IMPART Awards will confer SGD 20,000 in funding: SGD 15,000 in cash towards your art practice and SGD 5,000 towards a 4-day exchange in New York City with visits to the Asia Society Museum, The Whitney and MOMA organized by Art Outreach. Winners will also enjoy exposure at the IMPART Awards Gala during Art Week 2019 and be invited to participate in all IMPART Initiatives. Tell us about yourself and show off your work (no new work necessary).